Kimchi, a staple in Korean cuisine, is a traditional side dish made from salted and fermented vegetables, most commonly napa cabbage and Korean radishes, with a variety of seasonings including chili powder, scallions, garlic, ginger, and jeotgal (salted seafood). 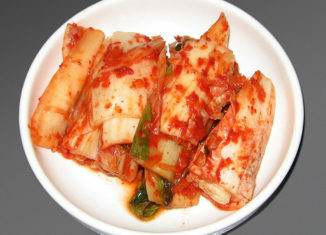 There are hundreds of varieties of kimchi made with different vegetables as the main ingredients. In traditional preparations, kimchi was stored underground in jars to keep cool, and unfrozen during the winter months With the rise of technology, kimchi refrigerators are more commonly used to make kimchi. Is is mainly served as a side dish with every meal, but also can be served as a main dish. Yeolmukimchi is also a popular choice during the spring and summer, and is made with young summer radishes, and does not necessarily have to be fermented. Bokimchi is best made fresh before a meal and are made with cabbage leaves wrapped around a blend of other inner ingredients such as seafood or fruit.